Cain, Susan. 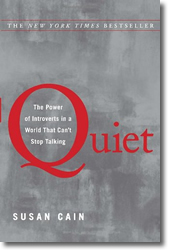 Quiet : the power of introverts in a world that can’t stop talking. Crown Publishers, 2012. A former dean, a brilliant but quiet man, once remarked that when he was a student, he was often frustrated with his teams, which were prone to making suboptimal decisions. He felt that he could have done better by himself. In her new book Quiet, Susan Cain explains that MBA classes are composed of bright students whose backgrounds include leadership roles in clubs, teams and community activities and most of these leaders are extroverts. When in a group situation, these students’ aggressive communication styles overshadow the contributions of thoughtful introverted students who are often better prepared. Cain makes this observation at the Harvard Business School, the “Spiritual Capital of Extroversion,” where future leaders in business and government are taught to act confidently and make decisions in uncertain situations. Grades and social status depend on speaking out and interacting with others. In class, students who speak often and talk fast are considered more intelligent, creative and appealing than their more reticent classmates, even though their suggestions are no better overall. Graduates enter a business culture where verbal communication and social interaction are key predictors of success. And so it is with American culture. American culture is extroverted; European culture is somewhat less so. People admire dynamic speakers, and have difficulty distinguishing between good presentation skills and true insight. Asian cultures are more reserved, and the potential and contributions of Asians are often undervalued. Author Cain discusses these cultural issues and a host of others, weaving personal stories with facts from recent research in psychology and neurology. And what about Fuqua? Management Communications professor Mark Brown told me that when tested, Fuqua students as a group score very high on collaboration, 6.3 out of 7 on a 7-point scale. “Collaboration involves actively drawing people out, even quiet people, to find out what their ideas are. One of our big challenges on teams is to get teammates to understand that introverts need time to think issues through before they take a stand. They need the time to “bake the cake” before you ask them to serve it. Extroverts need to stop trying to engage Introverts in continuous dialogue and just shut up until their Introverted teammates are ready to serve the fully baked cake.” Introverts and extroverts alike would benefit from reading Quiet, an intelligent and insightful book. David, Greg. 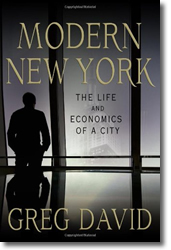 Modern New York : the life and economics of a city. Palgrave Macmillan, 2012. Last month I went to New York City. It had been 40 years since I had last visited there. I found it to be much changed. Business journalist and New York resident Greg David explains why. In his new book, Modern New York, David chronicles the economic history of the financial capital of the world. Beginning with New York’s fiscal crisis of the 1970s, when the city was almost forced to declare bankruptcy, David weaves together the facts and stories about the companies and people who created modern New York. David attributes the tough times in the early years to economic mismanagement, the increase in social programs, the effects of rent control and the increase in business and personal taxes brought on during the administrations of mayors John Lindsay and Abe Beame. He attributes the good times in later years to the business-friendly administrations of mayors Ed Koch, Rudy Guiliani and Michael Bloomberg. David admits that the four Wall Street crashes since the 1960’s resulted in more concentrated wealth, but he explains that greed has been good for New York. Wall Streeters spent their income on housing, entertainment, dining and retail and the fortunes of the city improved overall. Through the last 4 decades, most factory and shipyard jobs were lost, replaced by new positions in the exploding financial, tourism and technology sectors. The financial sector has been the cause of New York’s boom and bust economy, but the city sidestepped the worst effects of the 2008 financial crisis as Washington bailed out the big banks and Wall Street firms. David counts on the bankers, traders and financial executives to design more Wall Street innovations to send their own pay and bonuses soaring, which will increase tax revenues, create jobs in the trickle down economy, and save New York’s future, regardless of the harm it may cause elsewhere as other Americans lose their jobs and homes. This book is recommended for people interested in economics, finance or New York City.